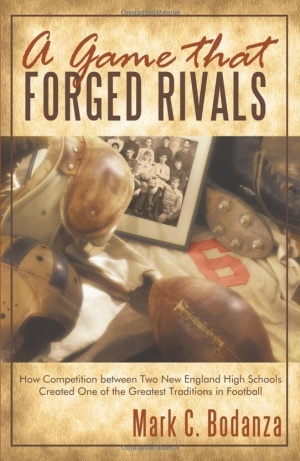 In A Game That Forged Rivals, author and historian Mark Bodanza captures the human drama of one of the nation’s oldest football rivalries; the high schools of Leominster and Fitchburg have met on the gridiron for 114 years. This long-standing competition has weathered many challenges, including major developments in the sport, wars, economic turmoil, an epidemic, and technological and social change not imagined when the teams first met in 1894. Through all the years and contests, thousands of athletes have competed for pride and a belief that this game was the pinnacle of their football days. A Game That Forged Rivals shares the stories, dramatic clashes, and challenges that tested these young men both on and off the field. Compiled from newspaper articles, school yearbooks, game programs, eyewitness accounts, letters, photos, and archival records, A Game That Forged Rivals not only chronicles the development of football from its earliest days, but also tells the story of two communities that saw, in football, a way to grasp civic pride. Order your autographed copy of A Game That Forged Rivals today!